Imagine yourself on the water – Sailing! Advantage Boating was established in 1992 as the Ottawa Sailing School. Its founding mission was then, and remains today, “to provide the best in boating education and on-the-water adventure”. We offer the highest quality sailing programs and our commitment to excellence has led us to become well respected in the sail training industry. Because of our excellent reputation in the sailing community, “word of mouth” is the number one reason people take their sailing courses with us. Safe, exciting, easy to learn and fun are only some of the words used by those that have made sailing their primary recreational pursuit. Boating is not simply a sport but a lifestyle. Join us this season to see why so many find sailing to be one of life’s most rewarding experiences. Come aboard and discover for yourself how enjoyable and easy it is to experience this adventure. Class sizes for our on-water courses are deliberately small to ensure plenty of individualized attention and maximum hands-on time for each student with the aim of ultimately providing you with the confidence you need to become a good sailor. Whether you are taking a course in Ottawa, Kingston or down south, you will find our boats both comfortable and safe. Each is a pleasure to sail and well suited for your particular course. 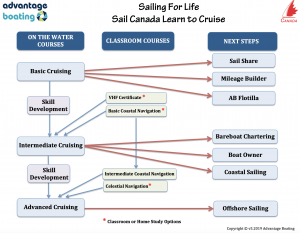 Besides learn-to-sail training programs, Advantage Boating offers services in three other key areas of on-the-water adventure: boat share program, boating vacations, and corporate team building programs. Advantage Boating is a member in good standing with Ontario Sailing, International Yacht Training Worldwide and Sail Canada.